Not happening to my family; how did I miss the symptoms??? I think I missed all of Joey’s symptoms of type 1 diabetes for a couple of reasons. The first being I just knew this disease couldn’t happen twice to the same family, my grandson Cooper was diagnosed in 2006, just two years before Joey. And second, even though I preached about knowing the symptoms, I didn’t recognize them when they were looking me in the face. I think I use the “it can’t happen to my family” as a coping mechanism. If I let my brain except the fact that it could happen to my family, then I’d go crazy worrying about everything that could happen. Which I have been allowing my brain to go there lately, especially with Tony getting into cars with friends, now that they are starting to drive, yikes, another story for another time. Obviously type 1 diabetes did happen to my family, twice now, and who knows if another family member will be diagnosed, but one thing is for sure, I have never asked “why us?” I can’t let myself go there because the answer is “why not us.” I don’t think that God said, “OK, today 80 kids/adults are going to be diagnosed with type 1 diabetes, and 35% of those are going to have Celiac disease as well. Let’s see, today that will be Joey, Susie, Jake.” No, I don’t go there. If I did allow this type of thinking, then I would be a very angry, bitter person. I try to keep a positive attitude, I except the fact that it is what it is, and move forward. Education is the best tool that we have to help people understand the disease, and hopefully prevent another child from getting very sick during diagnosis. With that said, here are the signs of type 1 diabetes, please see them for what they are, and if your child has any of the symptoms, please call your pediatrician and ask for a simple urine or blood test. You can even buy urine Ketone Strips at your local Super store, and test them yourself. High Ketones mean to call your pediatrician immediately. Increased thirst: Joey asked me to have a glass of water ready for him, so when he came in from school, he could just run and get his water. HELLO, biggest sign out there??? Frequent urination: The morning of May 10th, 2008, Mother’s Day, my boys were wrestling in the floor as I read the morning paper, Joey got up and said, “I just peed my pants!” We blew it off to him laughing so hard. REALLY?? He’s not 60 with a weak bladder!! Extreme hunger: We would be in the car, 10 minutes from home, and Joey would start crying and saying he was “starving,” and needed food right then. I always thought he just wanted McDonalds!! I cried after he was diagnosed, because I would get so mad at him. I felt so guilty. Weight Loss: Joey lost 8 lbs from his last Dr. appointment to his diagnosis day. Honestly the kid wore his clothes so loose that I never noticed an 8 lb loss. Think of 8 lbs of hamburger meat, that’s a lot of weight for an 8 yr old! He was STARVING all the time, but losing weight, how did I miss this?? Fatigue: The Friday before that Mother’s Day, it was High Interest Day at school, I was there taking pictures of the kids. 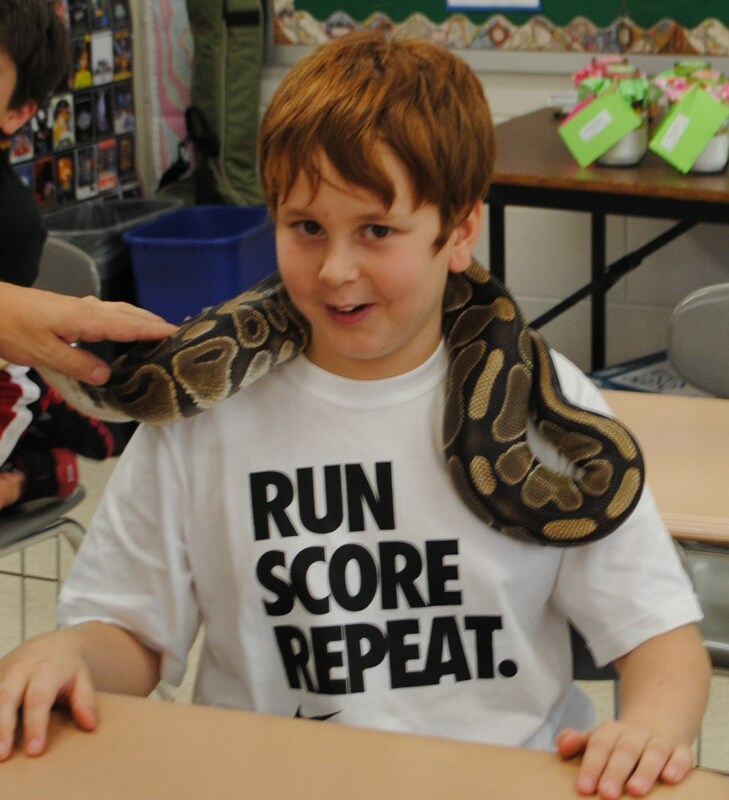 Joey was in the Reptile room, I remember the year before he had a snake wrapped around his HEAD, this year his head was on the desk. When I asked him if he felt OK, he said he was “just tired.” Tired with all those lizards and snakes??? Come on, RED flag Mom. Blurred Vision: The one symptom he didn’t have! Please, if I can redeem myself to my own child, by helping you understand the symptoms, therefore can watch for them, and maybe catch it in the beginning stages, it gives me some peace. Or, if it’s “not going to happen to your family,” then please share with your friends, so they can be prepared. I feel for you. My son was diagnosed in kindergarten, two years after our daughter was diagnosed with type 1 diabetes. I feel so sad for families with multiple kids with type 1, but then I remember that I am one of those families. My son and grandson both have it, and we are together a lot, so I get it. It’s harder because you’re dealing with double the work, but at least we knew what we were doing when the 2nd was diagnosed. Trying to see the cup half full. ha-ha. Happy New Year.